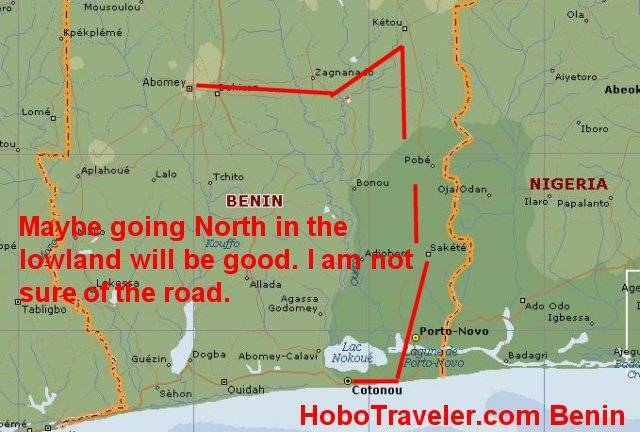 I think I discovered a good path to follow through Benin to Niger, well at least the next few cites north of Cotonou or round about. This route will take me over to the Capital, Port Novo of Benin, then I can go up along the Nigeria border, the bleeding of cultures is always interesting to me, so this is good. I am not sure of the road, it is not obvious on my maps there is a road that goes north, although there is a train. I think there is a road; I really need some better maps. Life would be easier with better maps. The point of going north is to me is to cross over different cultures and see, as I leave the coast, enter the marshes, maybe or up to the higher grounds, how doe the culture change, and maybe understand why. The farther from big transportation hubs the more primitive in many ways.